The Formentera Council's emerging technologies department announces the CiF website's newest functionality—an archive of "e-minutes", or videoactes, covering plenary assemblies at videoacta.consellinsulardeformentera.cat—is up and running. The first upload includes session minutes and are indexed by speaker contributions, as well as a link to the pdf from the meeting. When the CiF chairman unveiled the new platform today he was joined by deputy chairs Bartomeu Escandell and Alejandra Ferrer and team worker Xavi Oliver. 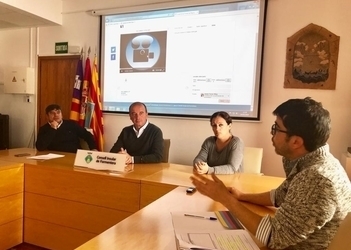 Ferrer said the new technology is about “giving everyone the tools to find out what's going on in our expanded monthly sessions—it's a huge step in the direction of keeping islanders in the loop on Formentera Council business”. Full video footage of the February assembly is available online, and islanders are just a click away from consulting meeting agenda items and individuals' interventions on the assembly floor. The sessions are also livestreamed on the Formentera Council's YouTube channel. The first to be broadcast live, the CiF's February plenary is also available digitally on the videoacta platform. Ambiser, a firm that specialises in video broadcasting, was brought in to set up cameras and instal the operating system. The service costs €13,081 (plus VAT) in its first year and requires an annual maintenance fee of €5,000.